Pennsylvania anthracite is another material where the trend towards obsolescence and becoming a paleoresource can be shown statistically. Production of anthracite was 70.4 million tonnes in 1905, 49.8 million tonnes in 1945, 13.5 million tonnes in 1965, 4.3 million tonnes in 1985, and 1.5 million tonnes in 2005. The amount used per person was 84 kg per person in 1905, 7.1 kg in 1965, and 0.8 kg in 2005. Compare this to the USGS anthracite reserves of 18.6 billion tonnes and total resources of 79 billion tonnes; the anthracite demand has dropped so much that these resources are more than perpetual. ^ Willard, B. (2011). 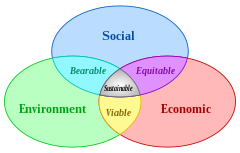 "3 Sustainability Models" citing The Power of Sustainable Thinking by Bob Doppelt, and The Necessary Revolution by Peter Senge et al. Retrieved on: 2011-05-03. ^ P. D. Laverty, L. J. Nicks, and L. A. Walters "Recovery of Flake Graphite from Steelmaking Kish" , U.S. Bureau of Mines RI9512, 1994, 23 p.
^ Harold A. Taylor. "The Future of the Mineral Industry" University of Minnesota, Minneapolis, Dept. of Mining Engineering, 1968, 15 p.